By davidf, October 16, 2012 in Plugins - Publishing ONLY! This plugin reduces an image to two colors, called "dark color" and "light color" in the GUI. The (greyscale) value of the original pixel determines the chance of being changed into each color. It is also possible to use only one of the colors and keep the rest of the pixels unchanged (see the rose on the right of the image below). High contrast images turn out best. Resolution makes a big difference; view results at 100%. Dark color -- the color that dark pixels in the original image have a higher chance of being set to. Light colour -- the color that light pixels have a higher chance of being set to. Options -- "use both colors", "lighten only" or "darken only": whether to use or ignore the previous two colors. Bias -- increase or decrease each pixel's value (brightness) before randomly deciding whether to use the dark or light color. Jitter -- instead of using the current pixel, use a pixel up to this distance away. Feedback welcome! (If something like this exists already, it was still good practice for my first plugin). I tried it out quickly on an ant from Google images, and the results are great. Pretty cool. Did you use CodeLab? I'll have to restrain myself from using this on everything! Yep, it was with CodeLab (which I am enjoying playing with!). 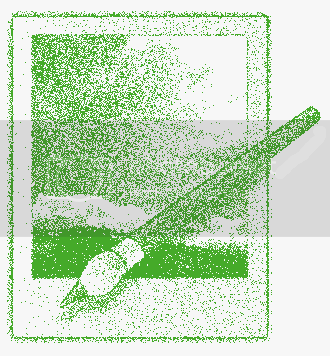 Hey, that's a real "pencil sketch" ... or maybe a "paintbrush sketch"
I assume Artistic is the most appropriate effect menu for this plugin, rather than Noise? I think the Artistic submenu is the perfect place for this plugin. It fits well between the Ink Sketch and Pencil Sketch. Nice job davidf! Wow!! Finally!! Been looking for this for over a year. I'm a neophite with PDN even after using (abusing) it for over a year. I have been trying to create this look for the whole time. Now greedy as I am ...... hoping you want to be able to take 6 colours (say red blue green yellow white and black) and do the same thing. Take a photo and reduce it down to 6 basic colours. Now greedy as I am ...... hoping you want to be able to take 6 colours (say red blue green yellow white and black) and do the same thing. Take a photo and reduce it down to 6 basic colours. Adjustments > Posterize to reduce to six colors, then Artistic > Dot with either "lighten only" or "darken only" selected, depending on the image. Is that the kind of thing you were thinking of? If not, could you describe it another way?